Traveling to new places is always exciting, but getting there is less so. Booking flights can be a real pain for instance. With Hopper you can now book flights and hotels at more affordable prices. 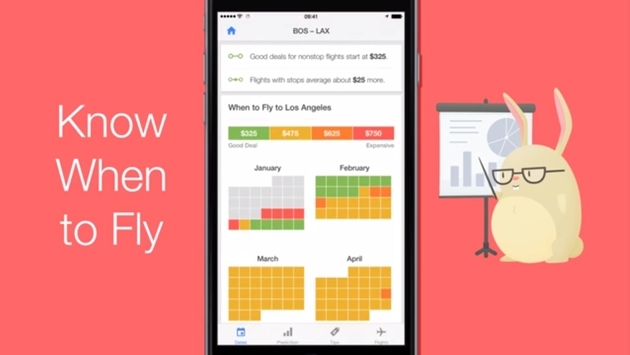 The app updates flight data regularly so you are assured of getting the latest information. All you have to do is tell Hopper your destination. Choose a one-way trip or round trip and then the app shows you the flight cost for the next few months. A color bar gives you an idea of the price. Green is an ideal price, yellow is regular price, orange is costly and red is prohibitively priced. Based on the information you will be able to choose a date for your trip. Enter the date and Hopper will tell you how much it may cost. The figures will be an estimate, how much you are going to save and the latest date that you can buy the tickets. If you are still unsure just select the option to keep an eye on the trip. Once you have made those choices, Hopper will list some airports and how much you will save. This is a nice feature that gives you an idea of the total expenses, and you also see the tickets’ total cost, the departure dates and all the flights available. Once you have made a choice, create an account in Hopper and choose a mode of payment. The cost is then displayed and then you can go on and plan your trip accordingly.